The topic of AI isn’t exactly new to science fiction (as a coffee break game, try to count how many times it’s appeared in recent films and TV). 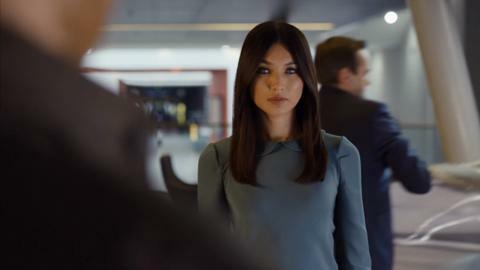 But Channel 4’s Humans has an intriguing approach to the subject – following various characters in a parallel 2015 in which household androids are commonplace – which works extremely well because, importantly, it feels not too distant from reality. We’re introduced to Humans’ London through the Hawkins family, who purchase “synth” Anita (Chan) to help out around the house. But mum Laura (Parkinson) grows distrustful of Anita’s relationship with the kids, and the family’s lives begin to spiral further out of control due to the gradual dawning that Anita is no ordinary synth but is able to consciously think and feel. Meanwhile, fugitive Leo (Morgan) and a gang of synths are searching for Anita, having known her in a past life, and are themselves hunted by government scientist Hobb (Webb). And this all somehow links to Dr. George Millican (Hurt), a retired scientist who clings on to his malfunctioning synth against the wishes of a stern NHS-provided synth nurse. It’s a lot to take in, and Humans does juggle a lot of characters, but on the whole, it does so effectively. If there’s one thing to criticise, it’s that certain strands of the domestic drama don’t work as well as others, particularly the withholding of information about Laura’s past – early on, we learn that she has a big secret, but the reveal is dragged out, and when it does come, feels largely irrelevant to the story Humans is trying to tell. But despite occasional flagging, Humans manages to tap into current issues and extrapolate them into eerie, fascinating sci-fi, giving us compelling domestic drama and character-driven thrills. Its finale ties the story up satisfyingly while leaving threads hanging for the recently commissioned second series, which can’t come soon enough.